This week’s featured product is the Winter Pond Treatment. What Is Winter Pond Treatment? Winter Pond Treatment is a revolutionary, biological pond treatment that has been designed to maintain a ponds condition during winter months. By keeping the bacteria levels topped up throughout winter, your pond will be in the best possible condition to fight off algae in the spring. How Does Winter Pond Treatment Work? Winter Pond is a natural, biological treatment that uses task-specific, low temperature patented bacteria to digest the organics that build up over winter. 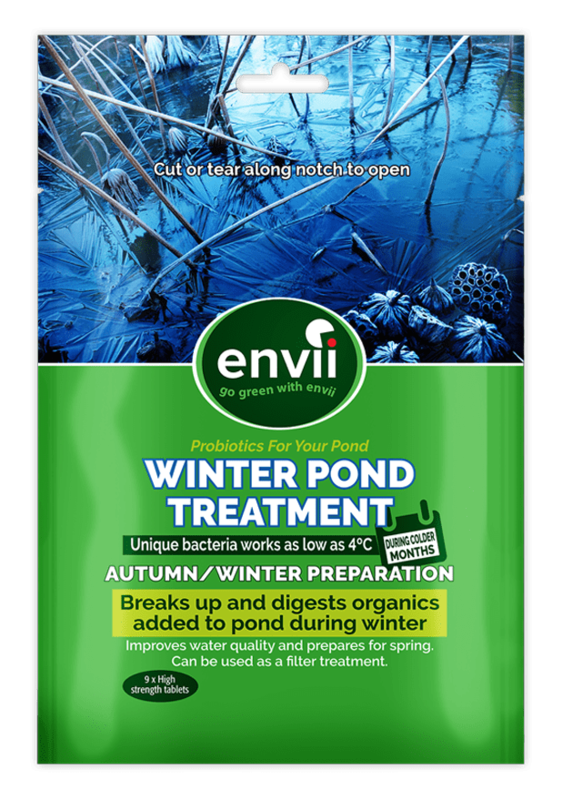 The bacteria used in the Winter Pond Treatment are exclusive to Envii and are capable of working as low as 4°C whereas other products stop working at 10°C. The task-specific bacteria target the algae and begin to digest it. Once the algae have been digested, it travels through the pump and into the filtration system where it can be caught and washed away. By keeping bacteria present throughout the winter months, they are ready to fight off algae in spring and stop water from turning green. Why Is My Pond Green in Winter? If your water has turned green during the winter months, this is due to the same planktonic algae that turned your pond green in Spring and Summer. Pond algae can grow down to around 8°C so depending on where you are in the UK and how harsh your winters are, there is a possibility that these algae have continued growing through the winter months. Winter Pond Treatment was designed to tackle this issue whilst providing protection through winter so that come to Spring, your pond is still crystal clear. Depending on the type of algae and the temperature then yes, algae can still grow in the winter. Algae can grow in temperatures as low as 8°C if there is sunlight and nutrients. Whilst these algae are not dangerous to your fish, it would be good practice to treat it throughout winter before it gets out of hand in spring. There are a couple of things that you can do to minimise the possibility of algae growing. Treat your pond during winter with Winter Pond Treatment and depending on the temperature, avoid feeding your fish as it is unlikely the fish will eat this food and it will just rot and feed the algae. How to Stop Ponds Freezing in Winter? This is not a common question that is usually asked in the UK but it is one that needs answering. Luckily the weather in the UK doesn’t usually get cold enough to freeze over our ponds but it does occasionally happen. Many people will think that a pond freezing over is natural and will just leave it to not disturb the fish. However, when your pond is frozen it is trapping in some of the natural gasses that usually escape your ponds, for example, carbon dioxide. These gasses can affect your fish, plants and aerobic bacteria. It is best to prevent your pond from freezing rather than having to deal with a frozen pond. You can buy pond heaters, that can be expensive, or you could try putting something that floats in your ponds such as a partially filled plastic bottle or tennis ball as this will leave a gap that can’t be frozen. If your pond freezes, don’t smash the ice! This sends shock waves through the water and can seriously damage your fish. If you find your pond has frozen, sit a pan of boiling water on top of the ice and let it melt slowly. Should You Feed Pond Fish in The Winter? As the winter months draw in, fish go into a semi-dormant state and you will start to notice them staying towards the bottom of the pond. When the temperature drops below 8°C you should consider switching to a wheatgerm feed for your fish. Wheatgerm is designed to be easier for fish to digest and provide them with slow releasing energy. When the temperature drops below 4°C it is advisable to stop feeding your fish. They won’t eat it which will result in the food breaking down and providing excess nutrients for any algae.